VDI or DaaS – What is Best For You? VDI or Cloud desktops – DaaS stands as a powerful alternative to VDI. But what is the right deployment for your organization? IT managers now have a significant decision to make, due to the rise of DaaS. Thanks to the Cloud, DaaS offerings are now more competitive than ever. So how can the conscientious system administrator make the right choice when it comes to VDI vs DaaS? First of all –why virtual desktops in the first place? With Virtual Desktop Infrastructure (VDI), the host desktop operating system is virtualized onto a central server and displayed to a remote endpoint device. Effectively, VDI grants the full desktop experience to end users on thin machines where all the heavy lifting and processing power is performed on the back end and not the device itself. VDI is intrinsically expensive, however, making it less accessible for any budget than DaaS promises to be. Major problems can also arise from server crashes or network failures. DaaS is very similar to VDI with the main difference being that the virtual desktops are hosted in a third party, Cloud backend. What is the main competitive advantage of hosting virtual desktops in the Cloud? Flexibility in pricing. Cloud desktops are made available as needed by your DaaS provider, which seriously lightens the financial investment needed to deploy virtual (Cloud) desktops. Also, all the maintenance is handled by your provider. This lets you dodge the IT overhead problem. It can also reduce the chance of a serious server failure. In the case of an outage, your virtual desktops can be piggy backed off of another server. 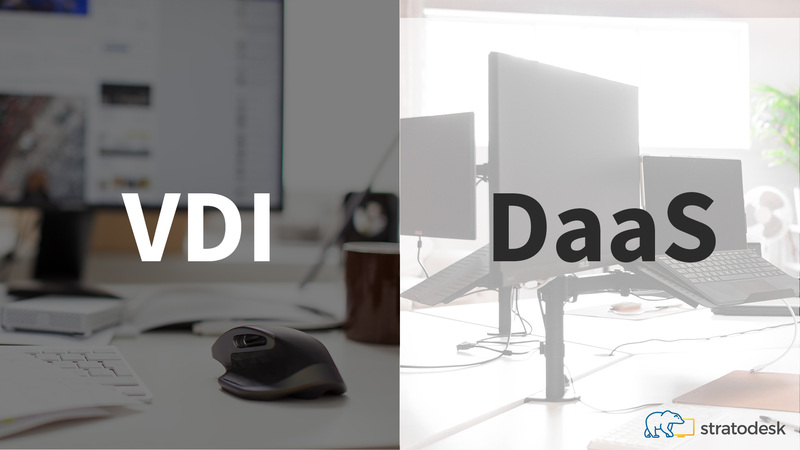 VDI or DaaS – Which is best for You? To summarize, VDI is best for large companies and/or organizations with the resources required to deploy and maintain an on-premises VDI. Such companies and organizations stand to reap the full security and even cost benefits of a fully controlled and customizable VDI. It stands to reason, then, that a company/organization most able to benefit from DaaS is any other but large organizations, as mentioned above. If resources and costs are a major deterrent to your business or organization, DaaS might be right for you. DaaS offers similar benefits to VDI with greater flexibility in terms of pricing. The fact that a third party handles everything for you can also be either good or bad, depending on your resources, organization size, and security needs.